Catie recently had her 3-week spring break, so we decided to do like we did last year, and go to Texas to visit my sister and brother-in-law. Before our trip, my sister had emailed me a link to the Exotic Resort Zoo, asking if I thought the kids might like it. It looked fun, so we decided to check it out. 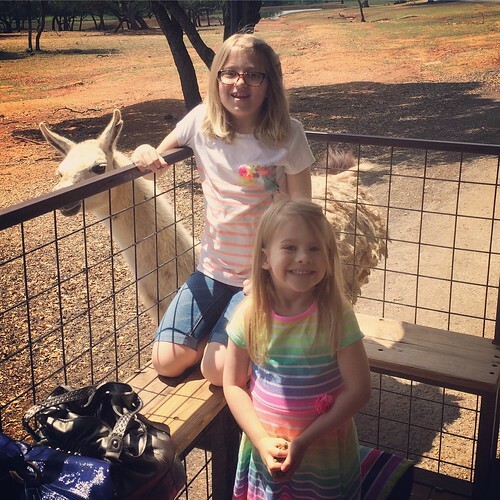 The Exotic Resort Zoo is in Johnson City, which is a little over an hour from Austin. And it was amazing. You ride in a covered trailer through the park, and all of the animals come up to the trailer so you can feed and pet them. (You buy a bucket of feed before the tour, you can’t just give them regular food.) They had llamas, zebras, buffalo, camels, ostriches, emus, rams, elk, antelope, gazelles, and a dozen other things I’m forgetting. It was so fun. Catie spent the entire tour halfway leaning out of the trailer trying to pet every animal that came near us. Lucy is a little more unsure about animals, so she spent most of the time picking up big handfuls of feed from the bucket and throwing it out of the trailer for the animals to catch. 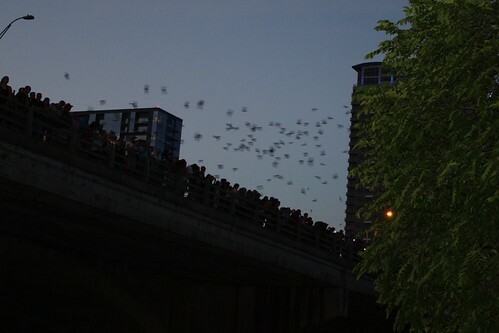 We also took another trip to downtown Austin to try to see the bats when they fly out from under the Congress Avenue Bridge at dusk. 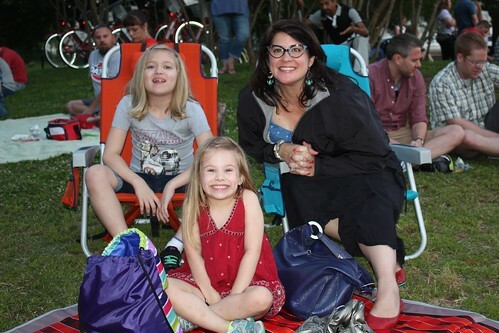 We did a lot of other fun stuff: had dinner with my aunt and uncle, and the girls got to play with their cousin Jackson who they hadn’t seen since Tracy’s wedding. We got to try out some fun local restaurants. We went to Mt. Playmore twice, and I’m still so jealous that we don’t have a place like that here, because it’s so much fun. 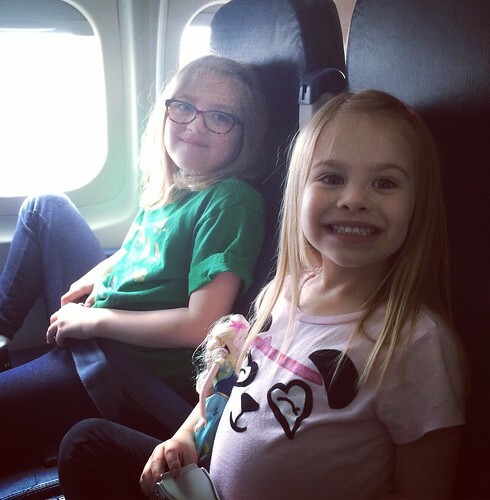 The flight home was pretty uneventful, the kids did really well again. Chris picked us up at the airport and brought us home. And even though Chris took good care of the pets while we were gone, Roxie was so happy to see us that she did literal back flips when we got home. She stood on her hind legs to do her little happy dance, but her tail was wagging so hard that she kept falling over backward. Catie’s back in school now, but it was a fun trip and I’m really glad we were able to go. 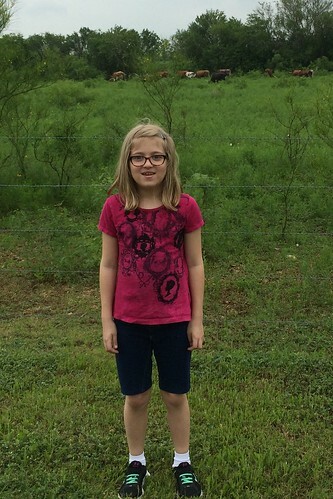 This entry was posted in Cate, Friends & Family, Lucy, Travel by Cindy. Bookmark the permalink.